You may wonder why I’d be writing about eyeglasses as a beauty product review but it’s par for the course when eyeglasses actually make you feel more beautiful. I don’t know when it became cool to wear glasses again, as I very clearly remember it not being when I wore them as a kid. However, these days there is just something smart about donning a pair of fabulous glasses. Not smart like the nerdy kid in school but smart like sophisticated, hip, and uber-confident. My urge to wear them has much more to do with a mood I’m in, the way I feel, rather than a contact lens that fell down the sink. You have to own the glasses and somehow it always makes me feel like I stand out in a crowd in a distinctive way. Bottom line I would wear them even if I didn’t need them! MOSCOT is a brand I discovered a couple of years ago and has been a New York City Institution for over 90 years. Patriarch Hyman MOSCOT began selling eyeglasses from a pushcart on Manhattan’s famed Lower East Side in the early 1900s and the rest, as they say, is history. The NEBB glasses with crystal frames were my top pick. They are from the MOSCOT Originals Collection based on styles from the MOSCOT archives from 1930-1970. . The NEBB is a chunky, rectangular, raw, aggressive and in your face glass. Warning, they are not cheap, but for me, have been worth it every second, based on the way I feel wearing them, beautiful and smart! I was first introduced to Binchotan as the best quality charcoal for purifying water with an alkaline effect. However, as I started to research the benefits, I came across Binchotan as beneficial for many other uses, including as a facial soap. Binchotan charcoal is made in the Kishu region of Japan dating back to the edo period. It works by absorbing harmful substances from various environments through its billions of pores and cavities which can decompose and destroy any toxic elements. I use this soap daily in the shower and only the shower, since the black soap can make quite a mess. It claims to moisturize but for me, it feels drying and a little tight after washing. However, I absolutely agree with the claims that it purifies, exfoliates, extracts impurities and stimulates blood circulation through its anti-bacterial properties. After using it for a couple of weeks, I saw a huge improvement in the radiance and consistency of my skin, not as many breakouts. My skin might feel a little dry right after use but I’ll take it for fewer pimples, and just add some moisturizer. I am a devotee to this ancient purifier! OK. I’m not going to lie. I can be a bit lazy. Who wants to sit there with an enzyme mask on their face for 20 minutes? Most of the time, I just want a quick fix! 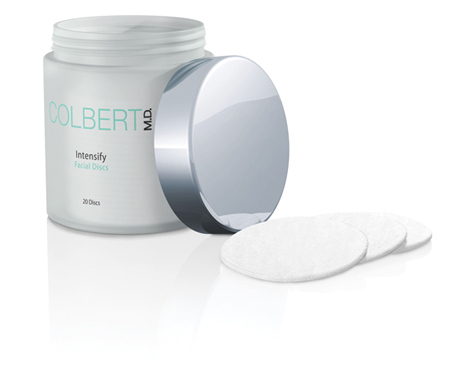 Dr. Colbert’s Intensify Facial Discs are not only a quick fix but super effective. It’s like a 2 minute non-evasive microdermabrasion session, leaving your skin glowy and bright in 120 seconds. I find myself reaching for these, more than any other mask or exfoliator type product in my arsenal (and yes, sadly it is a bit of an arsenal). It’s a lightning fast approach to fresh skin. I’m not exaggerating when I say that when I use this, I feel like a few years have been removed from my face! I personally use them once a week on a clean face. My 20 discs go a lot further that way. Circular motions are best. After I’m done exfoliating, I like to massage the enzymes in (or just let them sit there) for another minute, before lightly rinsing my face. Bromelain A highly concentrated form of pineapple enzyme, eliminates dull skin and clears environmental toxins. Promotes long term healing while leaving skin fresh and luminous. Lactic acid Agentle natural exfoliant, helps reduce fine lines, hyper- pigmentation and other signs of aging. Oatmeal: This common breakfast food is both exfoliating and moisturizing for the skin. 1. Treat yourself to an oatmeal facial once a week by combining 1 package of plain instant oatmeal, a half a cup of water, 2 tablespoons of plain yogurt, 2 tablespoons of honey, and one egg white. After mixing thoroughly, apply all over the face, let sit for 15 minutes, and rinse with warm water. Apples + Honey = Beautiful Skin. Enough said. 1. Combine a finely grated apple of your choice with 4 tablespoons of slightly warmed honey. Apply a thin layer to face and let sit for 10 minutes before rinsing with warm water. If you have sensitive skin, skip the apple and just apply the warm honey. Apple Cider Vinegar: A.C.V. has been called a miracle fluid because of its beauty and health benefits. It is believed that this vinegar can help to burn fat and suppress appetite, as well as regulate the PH of the skin and remove build up from the hair. 1. Mix a ½ a cup of the vinegar with 1 quart of water and use as a hair rinse after shampooing and before conditioning. To fight dandruff, leave on for 5 minutes before rinsing. 2. For acne prone skin, mix 1 parts vinegar with 2 parts water, soak a cotton ball with the mixture and apply all over the face as a toner. Our Special Guest, Jenny Karl owns and runs Jenny Karl Hair and Makeup Agency based in Los Angeles. She also hosts a makeup how-to series for EHow.com and is the LA trainer for numerous cosmetics lines.